Our basic time-frame is from 1873 (the year the Colt Peacemaker was introduced) and 1899. Our six-guns and holsters must be of a type that existed during that time period. 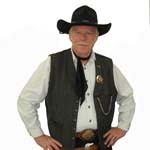 Cowboy Fast Draw is highly competitive sport and we do shoot for prizes and some cash awards. However, competition is held in less regard than the integrity of our game and sportsmanship. SAFETY IS ALWAYS FIRST. Our Motto is: "Safety First, Fun Second and Competition Third." Our founder's letter states, "It's about hand-shakes, camaraderie, a man's word, morality, friendship, fair play and honest competition. Our credo is 'The Cowboy Way' in action and deed; it requires no further explanation." This is a place where members and visitors alike can find the latest information about our sport, events and ideas that keep CFDA and its members on the cutting edge of innovation in the areas of club and competition management. This forum is also a place for friendly exchanges including congratulating personal accomplishments or acknowledging personal challenges. This forum is a great place to share and exchange ideas and explore them with suggestions and viewpoints of fellow members. While constructive suggestions are well within the spirit here, personal criticism is not. No inter-personal conflicts will be tolerated on this forum and they will be deleted. If you have a beef with someone, including CFDA Management, carry that on elsewhere. In a public forum such as this one, a slight personal dig can easily escalate into a major public conflict, caused by pride or misunderstanding. We suggest that you don't say anything here, that you wouldn't say while engaged in a friendly face to face conversation; because that is exactly what we are doing here. Distance may separate us physically, but not in Spirit of the Game that we all share. In keeping with the above statements, CFDA Management and our moderators will monitor this forum with these principles in mind.